By June 1, 2015, manufacturers and distributors in the US must comply with all modified provisions of the final rule which mandates that all chemicals are reclassified with GHS-formatted SDSs and labels for shipping to downstream users. OSHA granted distributors an extra six months (deadline of December 1, 2015) to distribute products with old labels and SDSs. As such, by December 1, 2015 all manufacturers and distributors operating in the U.S. must be fully compliant with GHS. 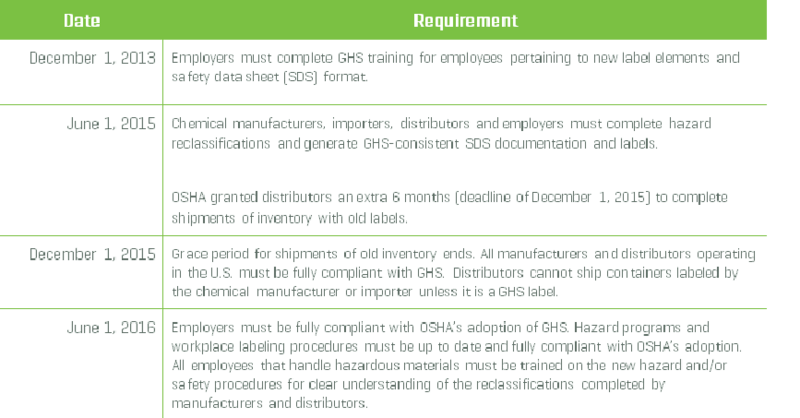 Then, by June 1, 2016, employers must have all hazard programs and workplace labeling procedures up to date and fully compliant with OSHA’s adoption. All employees that handle hazardous materials must be trained on the new hazard and/or safety procedures for clear understanding of the reclassifications completed by manufacturers and distributors. OSHA modified the Hazard Communication Standard (HCS) for enabling adoption of the international GHS system in order to increase safety and health for employees. This change promises to reduce the number of accidents, fatalities and injuries due to exposure to hazardous chemicals. GHS specifies a standardized approach for utilizing detailed criteria in determining what hazardous effects a chemical might pose and also mandates the use of standardized label elements which are assigned by a hazard class and category. These new procedures will provide a more common approach to classifying chemicals and communicating hazard information, reducing confusion and helping to ensure appropriate handling and safe use of workplace chemicals. Although numerous companies are already underway in the task of re-authoring MSDSs into SDS documents, and prudent employers have started updating their MSDS libraries with new SDS collections, there are also many manufacturers and downstream users alike who have not yet begun. Moreover, many manufacturers and suppliers may not be aware of the considerable differences that exist between MSDS and SDS determinations. While MSDSs and SDSs cover the required, regulated information pertaining to the hazards of chemicals, both documents are also very different in terms of product classification and in the way hazards are determined. MSDSs completed under OSHA’s HCS 1994 did not prescribe a particular order or format in which information should be provided. Many formats were used with hazard determinations based on evaluations of the amount of hazardous materials present (0.1% for carcinogens; 1% for other health hazards). If the quantity of a hazardous material met either of these criteria, then reporting was required. SDS documentation—aligning with GHS and consistent with OSHA’s HCS 2012—requires an internationally adopted 16-section version that specifies mandated headings and the order in which they should appear. SDSs are based on a collection of building blocks which provide a logical and comprehensive standard for defining physical, health, and environmental hazards of chemicals and are determined by classification criteria relating to logics that have been developed for each hazard class. Since SDS determinations are more in-depth and comprehensive as compared to MSDS preparation, manufacturers and suppliers especially who are responsible for rewriting these hazard reclassifications should actively be making plans for completing all necessary SDS documents in order to successfully meet the OSHA June 1, 2015 target deadline. Whether you are a chemical manufacturer or supplier, or a chemical user who needs to acquire new SDS documents and GHS-compliant labels, SafeTec has the right solution. As an industry leader in chemical inventory management solutions, we have the expertise and support to help you formulate and execute a successful GHS transition plan. Make sure to understand what your duties are under the GHS Rulebook. You will have requirements if you: import, manufacture, formulate, mix, distribute or sell chemicals. Make sure to know the transitional periods to ensure that you re-classify, label and package on time. Co-operate with others in your supply chain to make sure the changes are managed smoothly. Look out for the changes and check that you are doing what is needed to use the chemical safely. If you are an employer, alert your employees to these changes too. If you are an employer, provide your employees with adequate information, instruction and training. Follow the advice provided on the new labels and, where appropriate, in SDSs.